Thank you, Pinterest, for yet another awesome idea. The weather's starting to get cooler (hallelujah! ), leaves are just starting to turn, and you almost need a jacket when you go out in the morning. Bring on long-sleeved shirts, Ohio State football, and fire pitting in the backyard! 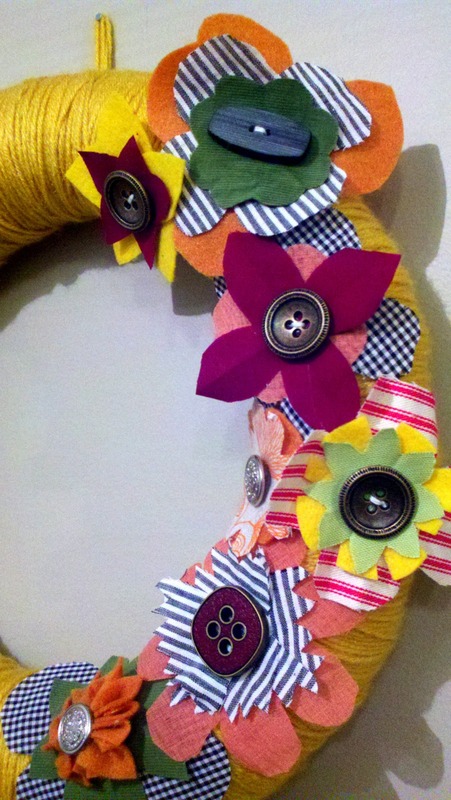 To celebrate the beginning of Fall, I'm sharing my latest project - a festive wreath! My sis (in law), Jasmine, is getting married in a month! Last weekend was her bridal shower in Indy, and as much fun as small kitchen appliances are, I wanted to go for something more personal. 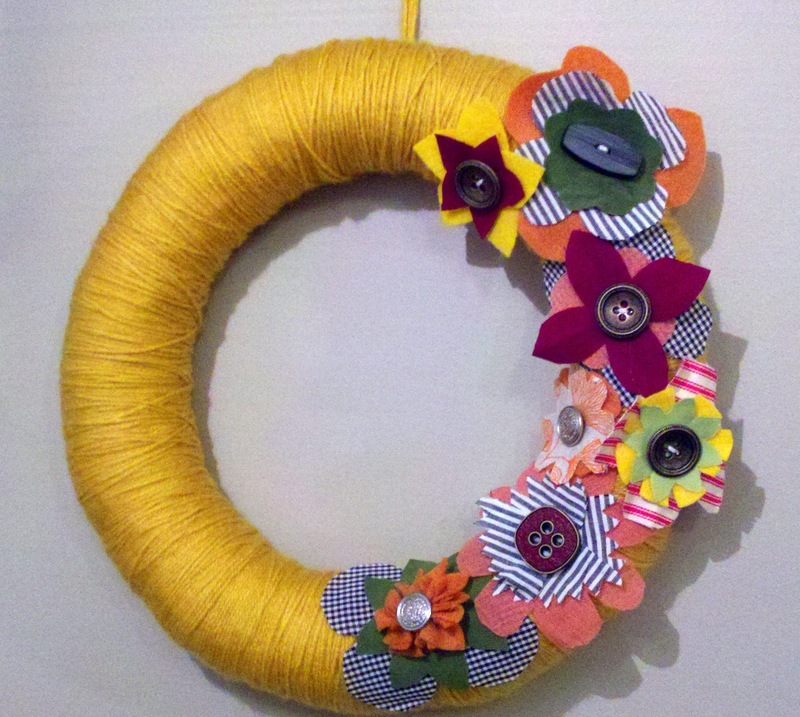 Then, I was browsing around my favorite blogs and found this awesome wreath on FreshHomeIdeas.com. It seems so very Jaz -- and for her Fall wedding, it was perfect; she and Jose Carlos definitely need something fun and personal in their new apartment. Not only that, but her wedding colors are very festive for fall - reds, yellows, oranges. This pretty wreath on the front door can be an exciting reminder that their big day is coming! Then, I wrapped yarn around it for what seemed like forever... I thought I was going to die still wrapping that yarn around the wreath! Once that was finally done, all I had to do was start cutting and hot-gluing. Jo-Ann even had a bunch of cool buttons on sale for $0.25 each from $3.99 for some of those things, so this was a fun and enjoyable project. Just like we used to do in first grade, I folded and folded and cut pieces of fabric like paper snowflakes. It's easy - just cut, glue, stack, and put a button on top. Sorry, I was on such a roll I spaced on taking in-progress photos. If you look closely, the fabrics on this wreath are lots of different textures -- the green fabric is corduroy, yellow is felt, orange is felt, and others are printed textures or linen-look. Like the inspiration wreath, I also positioned the flowers around on the sides of the wreath so it'd have some dimension. If you attempt this, I recommend hot glue.... lots and lots of hot glue! Only a few more weeks 'til the big day...Congrats girlie! Wow, This is amazingly beautiful. Love it! Pintrest inspired my latest wreath creation too! This is lovely. 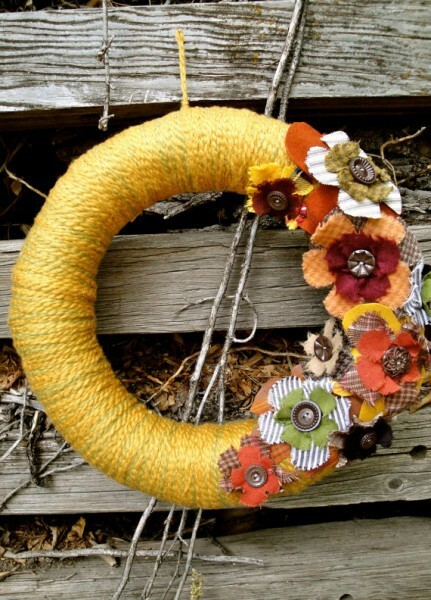 I made a yarn wreath in the Spring but I never thought of making one for Autumn! Very pretty. And Congrats to the sis in law!